ENSENADA, Mexico, November 23, 2009 – After taking an “out of nowhere” victory at the Baja 500 earlier this season, cancer survivor and off-road rookie sensation Joe Bacal nearly stole the show again with an epic 27-hour drive in the Cancer Treatment Centers of America JTGrey Lexus LX 570 to finish runner-up in the 42nd running of the Tecate SCORE Baja 1000 last Friday and Saturday. Driving through the dark desert night without the dust presents its own set of visibility problems but Bacal credits the banks of KC HiLiTES on his Lexus for helping him through. “The big KCs really light up the desert,” he noted. Aside from scheduled stops for fuel, there were few other surprises as Bacal used his considerable off-road skills to keep the big Lexus out of trouble for most of the race. As in his previous races, the BF Goodrich tires never failed, but Bacal did have one mechanical issue that required two stops to finally sort as the pounding desert landscape took its toll. Another unscheduled stop to free the rig after getting stuck briefly and Bacal and King never looked back, arriving back in Ensenada in just over 27 hours. 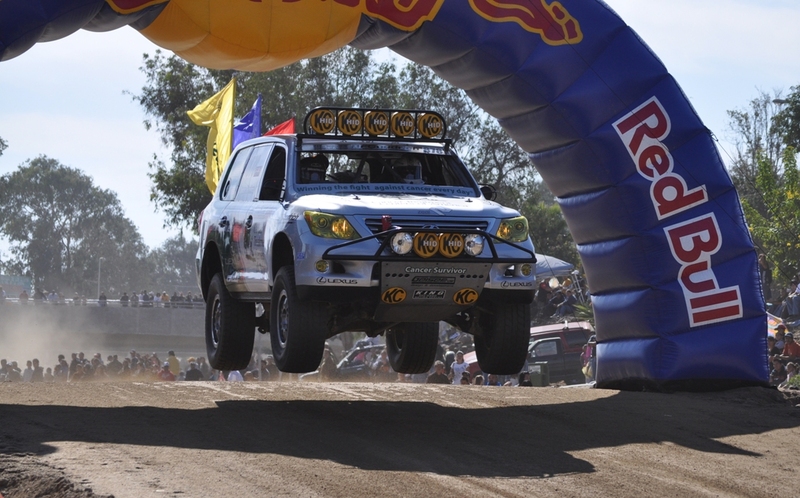 NBC Sports will provide delayed coverage of this year’s Tecate SCORE Baja 1000, currently scheduled to air on December 19 at 2:00 p.m. ET.